Overview of Recent Developments in the Mass Spectrometry of Nucleic Acid and Constituents. Mass Spectrometric Analysis of Deoxyinosines. Tandem Mass Spectrometry of Nucleic Acids. Mass Spectrometric Application in the Study of Cyclic Nucleotides in Biochemical Signal Transduction. Analysis of Urinary Modified Nucleosides by Mass Spectrometry. Mass Spectrometric Determination of DNA Adducts in Human Carcinogenesis. Sequence Distribution of Nucleobase Adducts Studied by Isotope Labeling of DNA-Mass Spectrometry. Electrospray Mass Spectrometry of Noncovalent Complexes between Small Molecule Ligands and Nucleic Acids. Electrospray Ionization-Mass Spectrometry for the Investigation of Protein-Nucleic Acid Interactions. Characterization of Noncovalent Complexes of Nucleic Acids with Peptides and Proteins by Mass Spectrometry. MALDI-TOF Detection of Specific Noncovalent Complexes of Highly Acidic Biomolecules with Pyrenemethylguanidinium. Quantitative Identifi cation of Nucleic Acids via Signature Digestion Products Detected Using Mass Spectrometry. Electrospray Ionization Mass Spectrometry for the Direct Analysis of Modified Nucleosides in Small RNAs. LC-MS/MS for the Examination of the Cytotoxic and Mutagenic Properties of DNA Lesions. 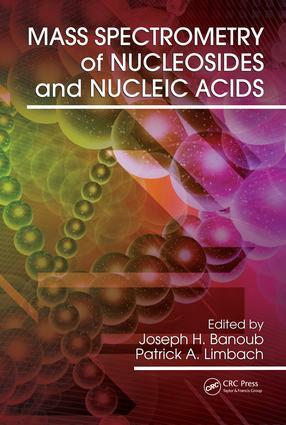 Influence of Metal Ions on the Structure and Reactivity of Nucleic Acids. Index. Joseph H. Banoub is a principal scientist and head of the special projects at Fisheries and Oceans Canada, Science Branch. He has been an adjunctprofessor of biochemistry at Memorial University of Newfoundland since 1984 and an adjunct professor of chemistry since 2006. His present research interests include the uses of tandem mass spectrometry for the structural elucidation of biologically active molecules. Patrick A. Limbach is a professor of chemistry and department head at the University of Cincinnati. His research interests include the development of new mass spectrometry methods for analyzing RNAs, the identification of unknown modified nucleosides, the characterization of RNA-protein complexes, and investigating the role of modified nucleosides in biological systems.